DI runner-up, Amanda Wood of Macomb Lutheran North - photo courtesy of George Pohly. Another Hansons Cross Country Invitational is in the books and, as expected, the 27th edition did not disappoint. Middle school athletes kicked the festivities off on Thursday afternoon at Stony Creek Metro Park with boys and girls varsity and junior varsity contests. In varsity action, Luke Peardon of Waldon navigated the Eastwood Beach 2 Mile course to win in 11:40.80. Peardon, along with Mason Taplin (5th place - 12:06.90) and Nathan Yee (7th place - 12:18.60) led Waldon to the team victory with 34 points. On the girls side, Shawnee's Jayden Harberts claimed the win due to her 12:26.90 effort. The middle school meet went great! Cross country was many of our introductions to the sport and it still feels special no matter what other experiences we've had in running. We had over 600 middle school kids out on Thursday! Impressive performances were demonstrated on day two during high school competition; the Division I boys race saw five athletes break 17 minutes, led by Alec Miracle of Birmingham Brother Rice. His 16:07.50 clocking secured him a comfortable win which represented his third top 5 finish in four starts this season. Miracle is ranked seventeenth in the state due to his 15:41.20 showing at last week's Jackson Invitational. Three girls went under the 20 minute barrier; two in Division I and one in Division II. 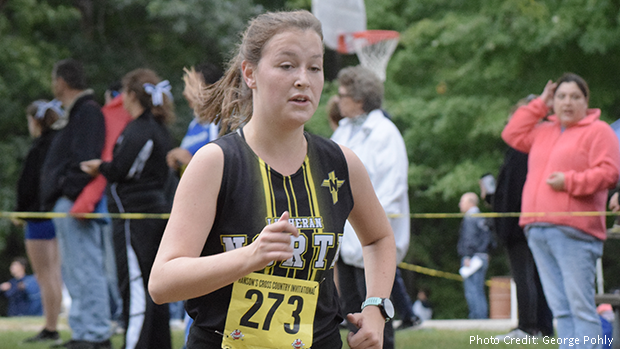 In DI, Elizabeth Bulat of Rochester went 19:05.90 for the victory and Macomb Lutheran North's Amanda Wood captured runner-up honors due to her 19:31.30 result. In DII, Bloomfield Hills Marian's Maya Harb posted a time of 19:37.50 to claim first place. For Bulat and Harb, these times represent new 5K pr's; Wood's clocking was her second best of the season.